Using data to understand place. In late 2018 Interesting partnered with the Tait Network, a collective of Architects, Landscape Architects and Urban Designers, to create a new venture. Inhabit Place. Central to the new venture is a data collection tool developed to capture and present quantitative data on trends of behaviour and users of public space. The Inhabit Place platform provides valuable data to practitioners already using place auditing as a tool for supporting their work. 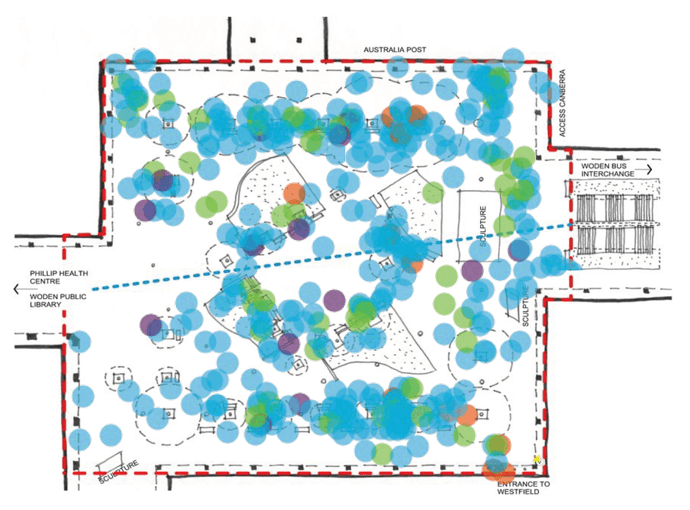 Place auditing is the process of capturing and analysing quantitative data on trends of behaviour and users of public spaces. The data collected is used to measure the impact of investment in the public realm in an effort to improve the experience of our shared spaces, from parks and plazas to streets, shopping centres, school yards and the communal areas inside apartment complexes. Inhabit Place is perfect for governments needing to justify the expenditure of public funds, developers seeking to show a market edge by committing to design excellence and iterative design principles and private businesses — like schools — needing to express the need for new investment/infrastructure and to show the effect of that expenditure. Interesting worked with the team at Tait Network to coalesce an existing paper-based data collection process into a new streamlined application enabling smooth, standardised data collection and the creation of easy to read, graphical reports.. Interesting worked with the team at Tait Network to coalesce an existing paper-based data collection process into a new streamlined application enabling smooth, standardised data collection and the creation of easy to read, graphical reports. Tait Network had created the paper-based auditing process to service a government body in the ACT, however, had found that the system, while producing excellent data, was not tenable given the amount of human resource it took to both undertake and analyse the results. To provide a system that was repeatable Interesting, reviewed the paper process and created a streamlined digital process that allows Inhabit Place to provide accessible, repeatable data capture. The audit process is always held across two days, a weekday and a weekend day. This approach ensures that the changing trends during the week are captured and understood. The other challenge faced was to rapidly create high-quality comparison reports providing analysis of the recorded data while allowing urban designers, architects and strategic planners use their knowledge to present data-driven recommendations for changes to improve public space outcomes. The Inhabit Place platform, created over the space of two months using the Agile project methodology has been an outstanding success. Within the first two months of launch, Inhabit Place have completed nine audits and outputted six detailed reports on public spaces using the new platform. Interesting, and the Tait Network both remain committed partners. A product development roadmap of new features and functionality will ensure that Inhabit Place can establish itself as a leader in the place data marketplace.